After a fairly wet spring and a blazing hot summer, Italian wine-makers have high expectations for their wines. Grape harvest is finished and wineries are enveloped in fermentation vapours. My friends who make wine have a big smile on their tired face. 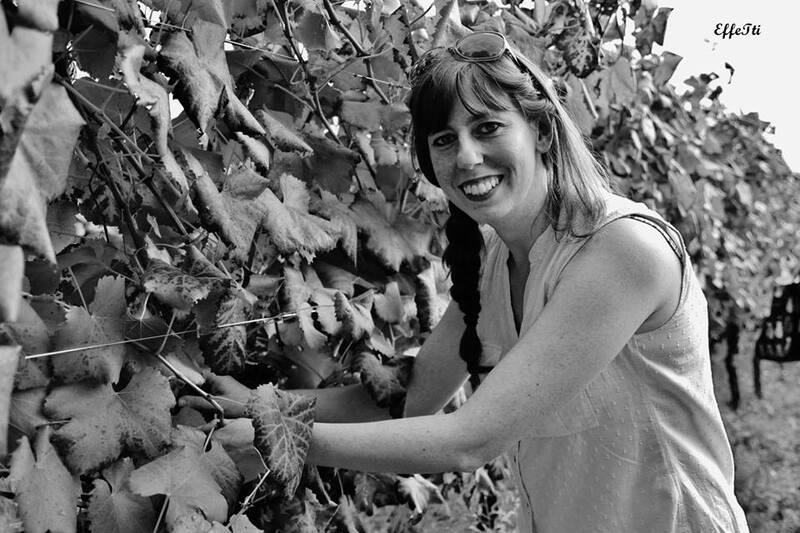 my friend Agnese harvesting grapes at Saio, her family’s vineyard near Assisi. The crop was healthy and the wine is expected to be bold and beautiful, especially the reds. This might even have the potential to be a memorable, age-worthy vintage. However, we will not know this until well into 2016. 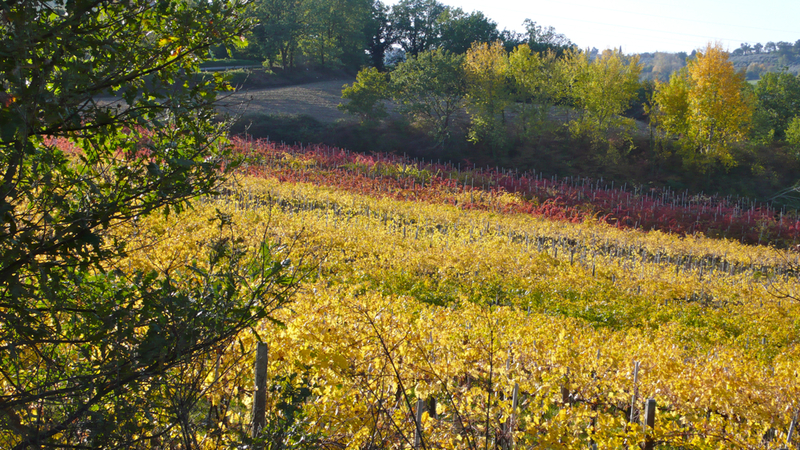 For now, we’ll enjoy the vineyards around us turning golden and crimson, the splendid colors of Umbrian fall. I am not sure if this confirms the optimism of the growers, but all grapes I have tasted this season are delightfully sweet, juicy and bursting with a rainbow of aromas. We don’t make wine but I have a few bunches on our pergola which we eat and cook with. By the way, did you know you can cook with grapes or fresh or fermented grape juice (mosto) anything you cook with wine? 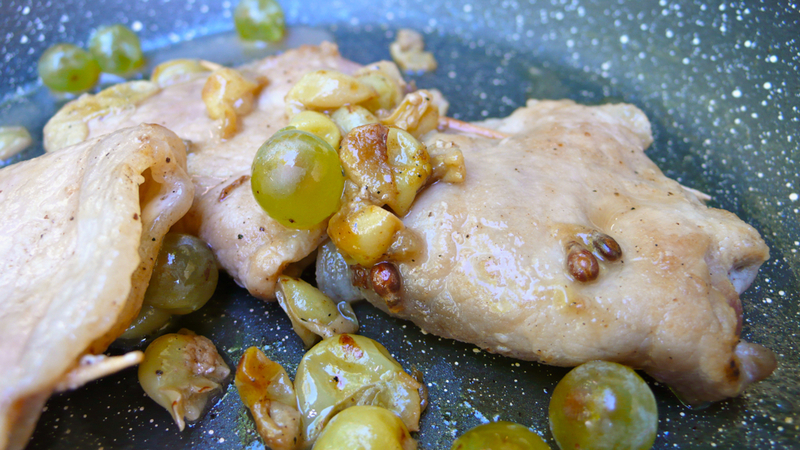 The Italian tradition is rich of foods made with grapes. The berries are often used to add interesting notes of sweet and sour to both dessert and savory dishes. This recipe is a variation of my classic pork saltimbocca where a handful of Trebbiano grapes is used instead of wine to deglaze the cutlets and offset the rich savory stuffing. Try it now, it’s the perfect time of the year. Top each slice of pork loin with 1 slice of guanciale and 1 sage leaf. Fold in two, keeping the guanciale and sage inside, and secure with a small cocktail stick. Lightly dust each parcel with wheat flour or gluten-free flour, rice flour or corn starch. Place a large cast iron skillet over high heat until hot. Melt 1 tablespoon butter in it until foaming. Add oil and pork parcels in a single layer, turning once or twice until golden, about 1 min per side. Season with salt and black pepper. Add the grapes to the pan and deglaze over high heat, scraping up the browned bits, about 2 minutes. Serve immediately with – for example – a potato puree and a zucchini carpaccio. The hillsides of Umbria look so beautiful in Autumn. Tasty dish to go with the Vendemmia. I’m curious to try this dish— sausages and grapes, too. If wine can balance out the richness of food, why not grapes, I suppose? yes, that is definitely the case Frank and a change on the usual white wine. Sausages and grapes is also a favorite!